We're just weeks away from peak flu season when those sick calls at the office will come more often and classrooms will start to thin out. What if there was a way for you to get a flu diagnosis and treatment without ever leaving home? Now there's a convenient solution that has been in Las Vegas for about a year. Physician Assistant Joseph Hamilton is a part of the crew at DispatchHealth that credits itself with bringing back the house call. It's on-demand urgent care that comes to your home. "So you can wait in your waiting room. In your pajamas and have your favorite music and environment," said Hamilton. 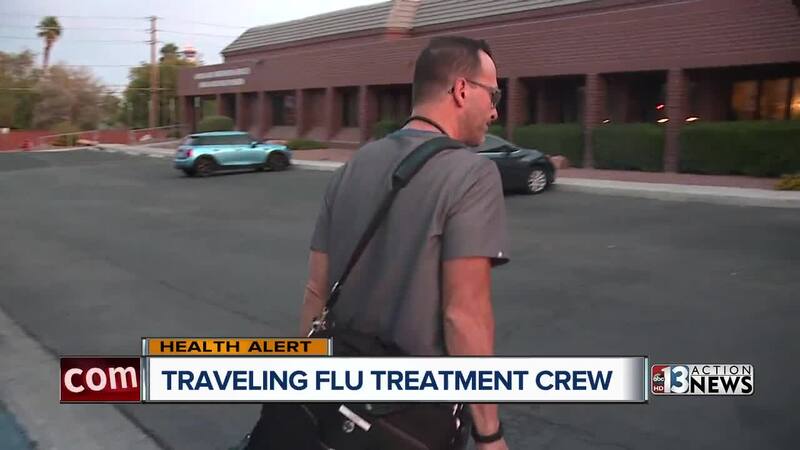 And as we approach peak flu season the Traveling Flu Crew will be in demand. "We'll get a history from the patient," Hamilton said. "And based on that history we may decide to do a rapid flu test right there." Test results can be ready in 15 minutes and within a certain time frame if a patient tests positive Hamilton can rush in a prescription for antiviral medication. All this in under 90 minutes. Bill Butcher is a spokesman for DispatchHealth Nevada. "We do work with insurance companies, most of them in Las Vegas. And for the insurance companies that we bill most cases the copay is the same as if they went to urgent care," Hamilton said. While it has been around since 2013 in other places the service just came to Las Vegas last December with just one car. "We're at three right now, " said Hamilton. "We're very busy." DispatchHealth is available 7 days a week, including holidays from 9 a.m. to 9 p.m.